Do you remember as a child how you anticipated your next birthday? “I’m 7 ½.” you’d proudly say, eager for the next six months to roll by so that you could declare, “I’m 8!” You held a dream inside of what it would be like to be eight years old. You didn’t know, but you’d seen others who were eight or who had been eight, and it looked like it would be pretty fun. You were growing and thriving. You couldn’t wait to see what the future would be like. You trusted the future. You were not afraid of the unknown. The power of anticipation kept you moving forward as a child – always eager about the future – what new . . .
. . . adventures or discoveries might be in store just around the corner. You could hardly wait. So fast forward a few years – or a few decades – and observe what might have happened in your thinking process and in your heart as the challenges of life came your way. What has happened to your dreams? Your sense of adventure? Your desire to discover? Hopefully you’ve had some brilliantly sunny days – warm and exhilarating. But I bet you’ve also stood by some rainy windows, waiting for the sun to come out. If you’ve lived any amount of time on this planet, you’ve known depression, despair, or discouragement. Perhaps only for moments or hours or days. Perhaps for weeks or years. But you’re acquainted with the pain – the heaviness in your heart. It’s a part of our human experience. Depression, despair, and discouragement are essentially expressions of disappointment – the sadness and pain that something you anticipated didn’t turn out the way you had hoped. You’re grieving. You were waiting for the sun, and it kept raining. Sometimes it got dark, sometimes days passed before the sun came shining through. 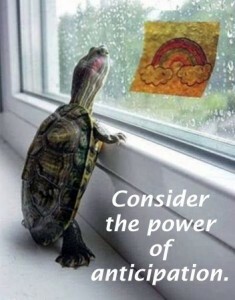 Maybe you’ve recently been standing by the window, watching the rain, and glancing at the rainbow post-a-note. Please don’t lose sight of the rainbow post-a-note. Okay, so now I confess I’m hearing Barry Manilow singing in my head, “I Made It Through the Rain.” Yes, that’s right. Sorry, can’t help myself. And we come shining through those lonely years. I made it through the rain, I kept my world protected. I made it through the rain, I kept my point of view. By the others who got rained on, too, and made it through. Sometimes you feel so afraid. And start your own parade. I made it through the rain. That’s my inspiration for you today. The sun will shine again. Connect inside with that hopeful anticipation you once knew as a child – that part of you born in innocence, that believed in and welcomed change. The energy of that anticipation – the experience of hope – this is your lifeline, your ladder up, your place to rest as you wait for the rain to pass. Consider the power of anticipation. Keep your eye on the rainbow post-a-note.